It’s been about a year since Enterprise Holdings bought Performance Gateway from Axalta, but nobody seems to want to talk about it. None of the three companies met our request to discuss Performance Gateway’s Axalta relationship or how it has and will in the future fit in with Enterprise’s vision. The “radio silence” with media on Performance Gateway actually seems to have been in place since about Enterprise’s acquisition of the company, which provides key performance indicator measuring among other services for collision repairers and insurers. The deal isn’t mentioned on the Performance Gateway news release page; in fact, no news releases have been issued since Aug. 1, about a month before the apparent sale date. The company’s last blog entry posted in November 2014. Neither Axalta nor Enterprise Holdings, which perhaps most notably owns Enterprise Rent-A-Car, seem to have produced news releases on the deal either. The Carlyle Group, which at that point still controlled a majority of Service King (Today, it’s a minority owner. ), created what we know today as Axalta with its Feb. 1, 2013, acquisition of DuPont Performance Coatings for more than $4.9 billion. 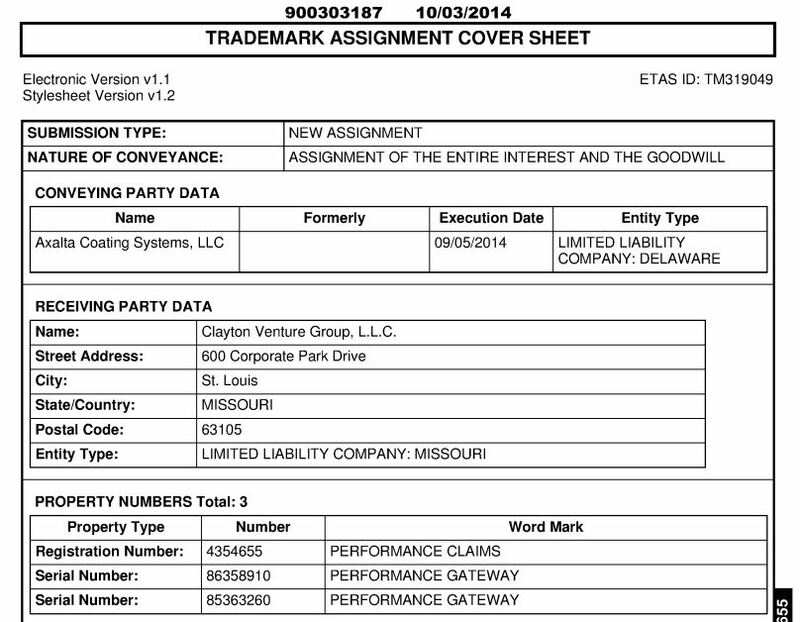 That deal included the “Performance Gateway” and “Performance Claims” trademarks. The trademark was officially granted this summer, though initially the PTO argued that “Performance Gateway” was too general a term before relenting. About that same time, AudaExplore announced July 31, 2014, a “long-term strategic partnership” with Performance Gateway, with the first phase being AudaExplore customers’ estimate data being integrated into the Performance Gateway Balanced Scorecard. 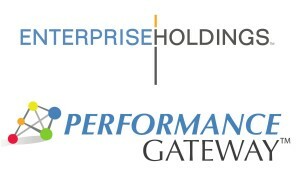 On Sept. 5, 2014, Enterprise Holdings appears to have closed on the sale of Performance Gateway, as PTO documents indicate all three trademarks transferred that day to Enterprise’s Clayton Venture Group. Intriguingly, Axalta’s first quarterly report ever notes the company earned $17.6 million by selling off assets from Jan. 1-Sept. 30, 2014, but of course, it’s unknown how much of that, if any, was booked from the Performance Gateway deal. Axalta became publicly traded Nov. 12, 2014. As mentioned above, none of the three companies met our request to discuss Performance Gateway’s time under Enterprise Holdings or its future with its relatively new parent company. However, Enterprise’s job board indicates Performance Gateway is certainly hiring. There are seven open positions right now for the subsidiary, six directly related to programming and information technology work and one business analyst who will be overseeing such digital offerings. Performance Gateway also is still providing rebate services through the General Motors-OEConnection Collision Link service, an OEConnection staffer confirmed Monday. Unfortunately, we couldn’t easily determine much else about 2015’s Performance Gateway. Which is a shame, for given its past adoption by top MSOs and apparent value to major collision repair industry partners like Enterprise and AudaExplore, it’s certainly a company to watch by collision repairers and insurers. Hopefully, it’ll provide a little more of that “complete transparency” about itself soon.